OhGizmo Review: Gelaskins (Updated) | OhGizmo! When it comes to my babies (a 4gig black iPod Nano, and my wife?s 30gig black iPod Video) protection is needed. Well, help came not from a new company, but one with a new design: Gelaskins. Combining 3M adhesive and vinyl technology with what has to be the coolest designs around, Gelaskins offers up a big spoonful of style and for not a lot of the green stuff. But with a cheap price tag of $15 per skin come a few shortcomings, such as lack of full coverage; I was left a little wanting. More after the jump and lots of pretty photos, and by pretty I mean obviously taken on my own. Opening the envelope, I was greeted by a nice note from Gelaskins and quickly pulled out the actual product for all to see. 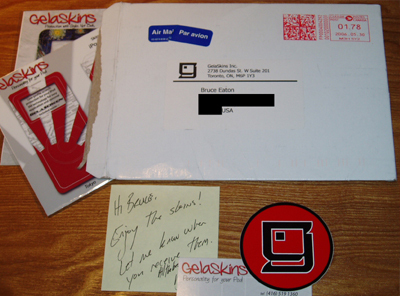 They were very generous and even gave me a sticker with their cool looking logo. The envelope came extremely quick from Canada to here in the US. Initial reaction was that everything was very nice, super glossy and made me want to just slap them on my iPods and wave them around. One very nice thing that I did not realize was that every skin was not alone but came with a screen protector as well. Once opened, I had an issue with use. I don?t know if I am just dumb or what, but I have never had problems applying stickers or decals [read: model hobbyist] but with these, they just would not go on right. The first one (the 30gig), when I was done putting on the skin, did not completely cover the entire face or back of the iPod. 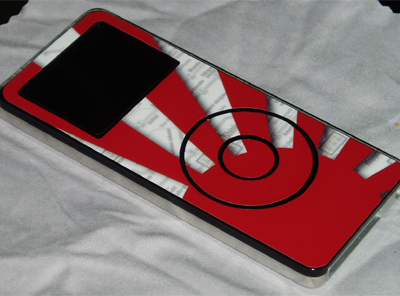 While actually providing an interesting touch of design to the back of the iPod with its design-surrounded-by-metal look, the front had edges of the actual player’s face exposed. This was due to the size of the skin not having the same dimensions. When I applied to the front and click wheel, there was a clashing of colors between my black iPod and the design of the skin. If it had been a white iPod I could see it melding well but the black was too harsh a contrast of warm hues of the skin with the dark cools of the iPod. With the Japan skin on my Nano, it worked well as the red/white design and black played off each other well but there was the same issue of no total coverage (as seen in the pictures). 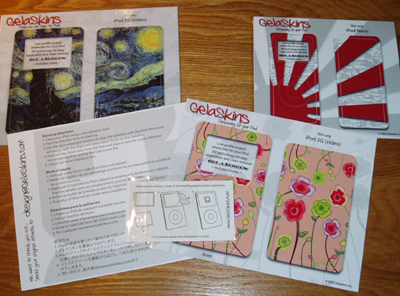 One of the highlights was the Gelaskins screen covers that they pack in. They are easy to apply, and unlike other cling-style covers, these smooth out and flatten so there are no air bubbles and allow for easy viewing of the screen without any haze or awkwardness of other such screen protectors in the same style. Before you read my next comment on the Gelaskins performance please note that when I define heavy use of my Nano, I mean heavy. I usually drain the battery everyday and listen to it everywhere: work, home, car, bathroom, kitchen. I also live in Texas, so it is also subjected to being exposed to 100+ degree heat and temperatures. I used these for a week and I use my Nano everyday for at least 4 hours [in pocket, in the car, in the home on dock]. Well, the skins performed very well. Docking was easy and they did not interfere. But by the end of the week, some of the corners of the skin would peel up and not stick as well as the first day, probably due to lint sticking on it in the pocket. A decent product for those who use their iPod regularly (read: not as heavily as I) or keep it docked but want some protection without spending a lot of cash. Not for the everyday heavy user, unfortunately, despite the very nice and extremely attractive designs they have. 1) Initially, Bruce applied the skins with the Clickwheel cutout. This thin strip of material is not meant to be applied, which was why it looked so funny. They looks far better without. To be fair to our reviewer, Bruce felt the included instructions could have been a little clearer about this point. 2) The rep was curious, from a product development standpoint, about the skin coming unglued. This prompted Bruce to clarify that he is a rather heavy user of the iPod, and therefore, the skins might be better suited to a regular/casual user. I have had mine for probably 4 months and no peeling. I think they were cheaper than $15 as well. thanks for the update. Readers first, PR second. I bought the steampunk skin, and I am not happy with it. On the website the image quality looks great. But the actual skin isn’t printed at a very good quality. 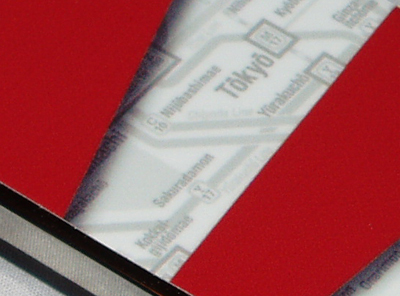 It is more blurry than crisp, and I would have liked it to have clean sharp edges. If I could have seen the actual skin in person before making the purchase… I wouldn’t have made the purchase. Also the sticker that goes onto the click wheel…. I removed that first thing because the touch sensitive doesn’t work very well with it on. BUYERS BEWARE. I ordered a new iPhone 3G Gelaskin and I have waited over 20 days for delivery. I’ve also repeatedly emailed their customer service regarding the state of my order and they DO NOT respond. I do NOT recommend using Gelaskins at all. I am probably going to have to dispute this with my credit card now. Don’t make the same mistake I did.